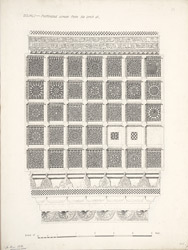 Illustration of a perforated screen surrounding the tomb of Mubarak Sayyid at Soljali from James Burgess' 'Original Drawings [of] Muhammadan Architecture in Gujarat.' The tombs at Sojali, a village near Mehmudabad in Gujarat, date from the end of the fifteenth century. The most notable tomb is that of Mubarak Sayyid, a minister of Sultan Mahmud Begada (r.1459-1511). At Sojali, six tombs are located within an enclosure and the tomb of Mubarak Sayyid is situated on the eastern side on a platform with four massive pillars which supports a series of domes which are incorporated into the principle dome. The principle dome extends to a height of 70 feet from ground level to the top of the finial. At the base of the principle dome, there is a row of windows with perforated screens. Surrounding the Mubarak Sayyid's tomb are more perforated screens constructed of stone. The remainder of the enclosure consists of a double corridor with 36 columns that support smaller domes.